I love my vegetable, legumes, and dairy. I am not morally against eating meat and fish from sustainable sources so a meat-lite diet works well with my lifestyle. Weekends are typically the days I prepare meat-centric dishes since those are meals I share with Little Brother. My recent two doses of protein and iron supplements are particularly delicious thanks to a little help from America’s Test Kitchen. 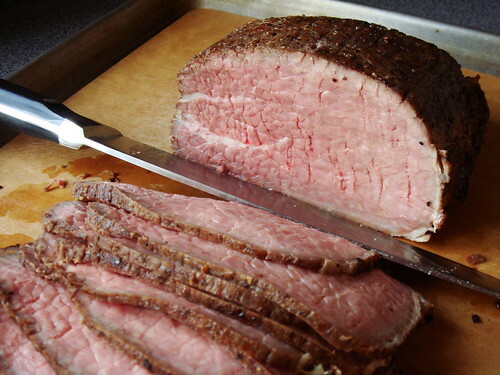 Let’s first talk about that rosy cut of roast beef, shall we? It came from eye of round, a relatively cheap and lean cut. 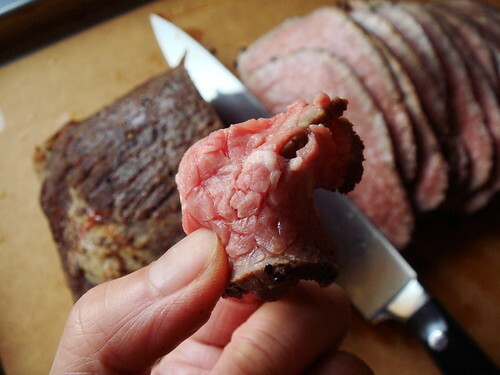 In order to produce a tender roast, the meat was given an overnight salt and pepper rub. I vacuum sealed it to promote more even brining. The next day, I seared the meat on all sides and let it roast at low temperature for a very long time. The result was a uniformly pink and tender interior that easily takes the spotlight of any sandwiches. The detail direction is available from America’s Test Kitchen (subscription only) and also the Cook's Illustrated Cookbook. 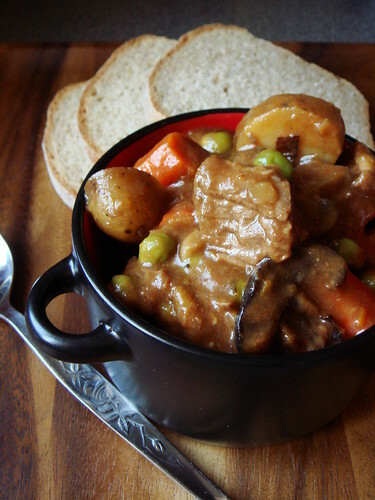 The beef stew is a welcoming sight on chilly winter days. It is hearty thanks to cubes of tender beef chuck, potatoes, carrots, crimini mushrooms, and peas slow-cooked in an aromatic mixture of onions, leeks, garlic, thyme, beef broth, soy sauce, and tomato paste. It is a bit more work than simply throwing ingredients into the slow cooker but the payoff in taste is worth the trouble. The depth of flavour from sautéing onions, leeks, garlic, thyme, and tomato paste with flour to create the fond is essential to the success of this stew. 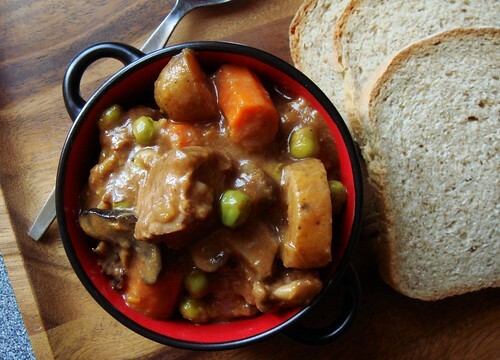 Little Brother happily declared this as the “best beef stew I ever made” and “so beefy!”. It is great the day it was made but even better the day after. The recipe is available from Cook’s Country (subscription only) as well as Slow Cooker Revolution. Given a choice between powdery protein/iron supplement and these honest home cooked beef dishes, are you surprise that I choose to eat the way I eat?